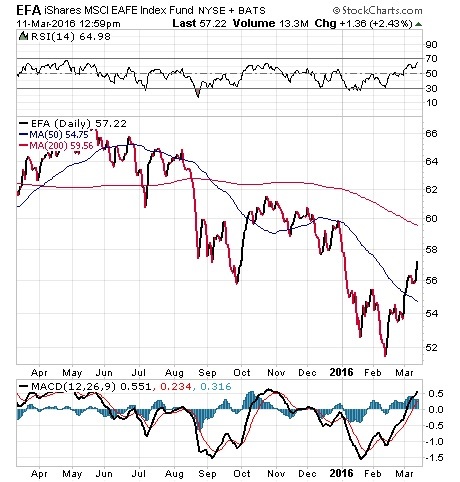 Investing Advice And InformationExchange Traded Funds (ETFs)Have We Emerged from a Bear Market Yet? Have We Emerged from a Bear Market Yet? Hey, did you miss that? If you weren’t paying attention, you just might have missed the fact that the S&P 500 index has breached key resistance at the 200-day moving average. That is a very definitive bullish move for domestic stocks, and one that comes just two months after the worst start to a year, ever. Now the question is: Does this mean we are in a bull market, or are we still in a bear-market rally that started in mid-February and that just hasn’t run out of fuel yet? While I would like to say with conviction that this is the start of a new bull, I can’t yet say that with certainty. 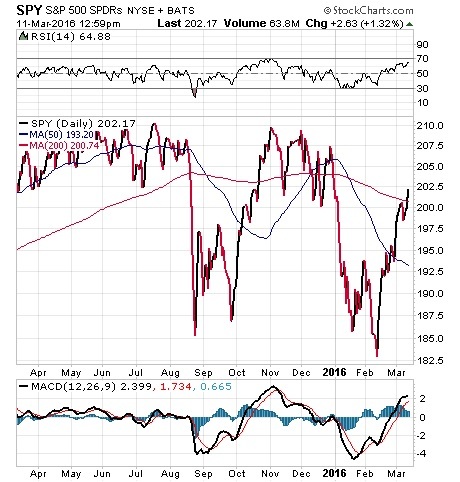 The reason is that the preceding chart of the SPDR S&P 500 ETF (SPY) also shows a lot of overhead resistance in the trading range we saw back in December. If stocks can clear that hurdle, it could indeed be another big run higher for the bulls. Meanwhile, overseas there was a lot of action this week as stocks around the globe reacted to the European Central Bank’s decision to cut interest rates further into negative territory and to expand its quantitative easing (QE), bond buying program. 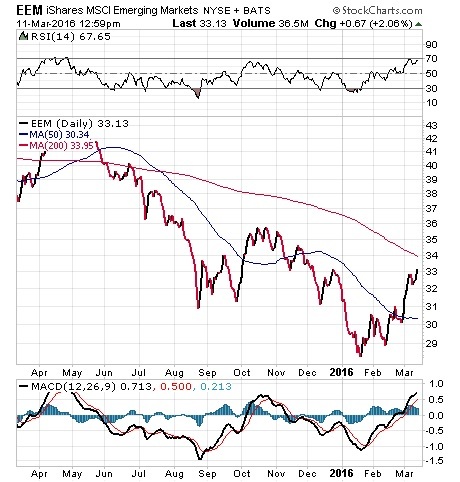 While stocks in Europe, Australia, the Far East and emerging markets have seen a nice move off of their respective February lows, these respective segments (see charts below) have yet to breach their 200-day moving averages the way the S&P 500 has. Still, the momentum here of late is very encouraging for the bulls, and another week such as we’ve witnessed over the past several weeks is going to start to convince even the most obdurate bears that conditions are worthy of getting back into this market. In fact, we’ve been persuaded that at least some key market sectors are now back in bull status, and we are taking advantage of that right now in my Successful ETF Investing advisory service. The former first lady was being laid to rest this week, so I thought I would honor her in my small way with the above quote. Not only do I think this quote is true in a general sense, I also think it’s important for all of us to give out as much positivity as we can. After all, the world is filled with too much negativity already. I encourage you to read my column from last week about the recovery of emerging markets and commodities. I also invite you to comment about my column in the space provided below. Economist Dr. Mark Skousen gives his take on a modern mantra.